Ancient Greece was the origin of democracy, history and theatre. Successive civilisations – Mycenaean, Classical, Byzantine – have left a language and a culture which survived centuries of Ottoman Turkish rule to re-emerge in the 19th century as modern Hellas. This was partially aided and abetted with the encouragement given by the young Lord Byron, who helped inspire the Greeks to throw off the Ottoman Empire. In the modern age, the beaches, islands, ancient monuments and shrines such as Delphi and Dodoni still inspire the traveller, however there is so much more to the country. Few would realize, but it is, after Switzerland, Europe’s most mountainous state, with Mount Olympus, legendary home of the gods, reaching almost 10,000 feet/2900 metres. The main mountain axis extends from the Pindos range in the north, through the Peloponnese and on to the island of Crete - offering a fantastic backdrop when hiking in Greece. Within the Pindos range are the wild and remote Zagoria Villages, famed for their traditional stone-roofed houses, and also the monasteries perched on the pinnacles of Meteora. Greece is botanically rich, notably Mt. Olympus and the Pindos peak of Smolikas. 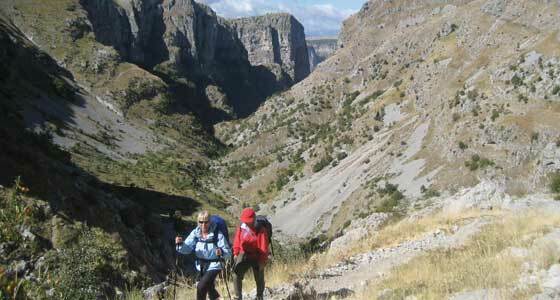 All of this makes it an rewarding experience to go walking in Greece. The dominant condition of Greece's climate is the alternation between hot, dry summers and cold, damp winters typical of the Mediterranean. Walk in summer, and experience Greece's hot, dry conditions and an average sea-level temperature of 27° C in July. Summer winds have a moderating effect along the coast, but very dry, hot winds affect the Aegean area. 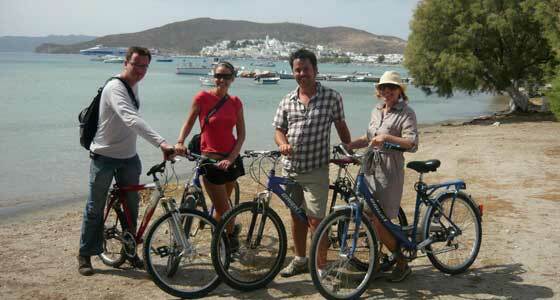 The Ionian and Aegean islands are especially warm in October and November. When you reach higher elevations in the interior, some rainfall occurs year-round, and higher mountains in the southern Peloponnesus and on Crete are snow-capped for several months of the year. The mountains of Macedonia and Thrace have colder continental winters influenced by winds channelled through the river valleys from the north.